To Do, To Done, Ta Dah! We all know how good it can feel to write the To Do list – you know the way it helps us plan and commit the tasks to paper. It’s an important psychological practice, as it helps to get all those things that we have to do out of our heads, where they can swirl and twirl and loop. Writing a ‘To Do’ list helps us empty our minds so we can focus better, prioritise tasks and it is definitely an effective tool. However, on the flip side, there are times when the ‘To Do’ list is so long that we are unsure where to start. It can even sometimes feel de-motivating to write a ‘To Do’ list because it just reminds you of all the things that have to be done in the little time that you feel you have. This is where writing a “To Done” list can be so powerful and can provide the opportunity to balance things up. 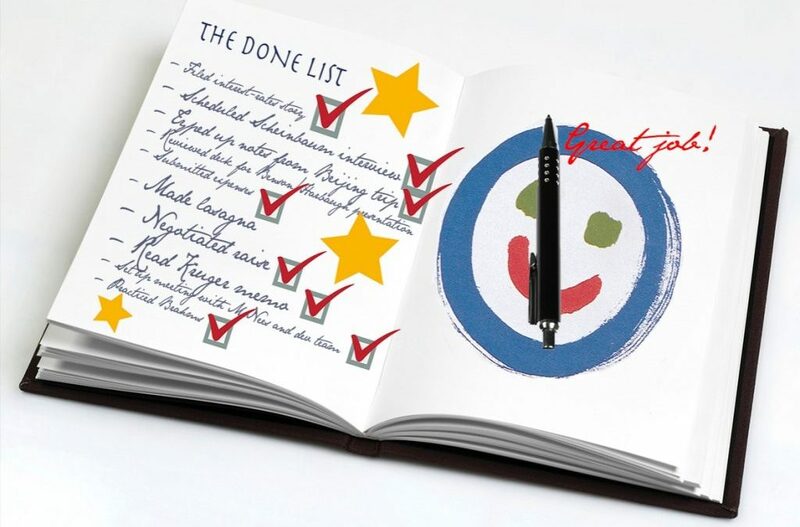 By simply writing down all the things that you actually have completed and therefore moved from “’To Do’, ‘To Done”, you can shore up your motivation and energy levels again. The principle behind the “To Done” list is to simply pause and acknowledge all that you have completed. We can be so busy racing from one task to another and believe me, as long as you are living and breathing, there will be things “To Do”, so what about balancing your energy and focus by giving yourself a pat on the back for all that you have already done, completed and achieved. Ah (big sigh) that feels better already. Try writing down the personal as well as the professional. After all, it’s your time and it’s good to acknowledge how you filled it. I find so many of us dismiss some of the functional yet noble tasks that life needs us to do, like putting on a wash, hanging out the wash, bringing the kids to school, looking after a sick child, making the breakfasts, lunches and dinners, doing the grocery shop, making beds and tidying. Then what about the business “To Do’s”? Like attending a meeting or back-to-back meetings as happens quite often during the working day, making phone calls, writing business plans, creating blogs, replying to emails, going for a walk, taking exercise, completing month-end accounts and so on. Go on, write all the things down that you moved from “To Do”, “To Done and I bet you’ll find your energy shifting and lifting and that you’ll feel better about yourself. I find that most of us (me included) focus on all the things we still have to do and give ourselves a hard time over what we haven’t achieved. You know that inner critic whose voice jumps up and fixes your gaze and attention on noticing what you haven’t done. What happens then is that we can waste a lot of our precious energy giving out to ourselves and beating ourselves up. Imagine though, for a minute, in some alternate supportive Universe, that the voice of the critic was actually wanting you to slow down to acknowledge all that you had done… what if the real intention behind the critic was to criticise you for not taking time to acknowledge all you had done so that you could move on to other tasks with more poise, energy and focus? I was working with a client this day last week, so it was a Friday and she was really cross with herself about all she hadn’t done. All she could see was what she had not completed that week and she was struggling emotionally with it. She said that she didn’t want to go into her weekend feeling like that because it would impact her and her family but she didn’t know how to let it go. So … what did we do? Well we thanked her inner critic for having such a strong voice that she had to notice it and then I asked her what she had actually completed that week. She thought about it for a moment and then started to list off the things that she had done. She stopped, she started, she articulated the list of the things she had done. She paused. I asked her to add in all the things that she had also done in her personal life and then she gathered momentum. She told me that she had been a single mum that week as her husband had been away on business and she listed all the things that she had done in addition to her work. Then she stopped “Wow”, she said, “I can’t believe that I didn’t acknowledge all that I had done and especially when my husband was away!” By articulating all the things that she had moved “To Done” that week, she had interrupted the negative flow of her angry thoughts against herself and she now felt more positive and focused. So, its Friday today, the end of the week. Your Action, should you chose to accept it, is to take a few minutes now or later to write your “To Done” list. Get a blank piece of paper. You can look back over your “To Do” list if you wish. Then write down all the things that you did do this week – personal and professional. Then give yourself a big pat on the back for getting through all of that. To Do – To Done – Ta Dah! Due to the demand for the Call to Purpose Workshop in May, I have decided to add one more date before September. It will be on Friday 8th July. If you feel “called” to be there, please register at the link below.